Easy Southern Corn Salad is a delicious staple in the South, especially in the spring and summer when fresh corn is readily available at the farmer’s markets. Easy Southern Corn Salad only takes minutes to make and, because it’s made without mayonnaise, it’s fresh, light and healthy. 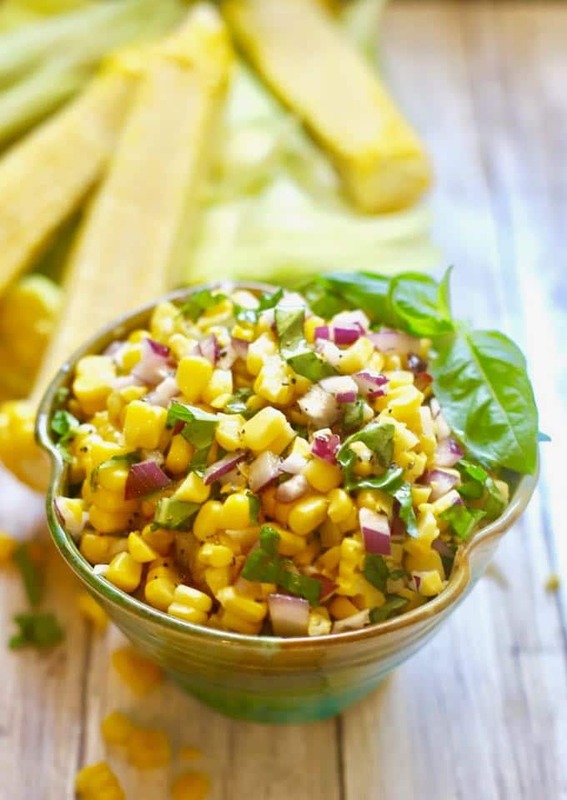 Coming in at only 155 calories per serving, this yummy corn salad is also full of vitamins and minerals. Both big and little kids will love it and it is perfect to take to a potluck dinner or a great dish to serve at a backyard barbecue or picnic. I made it last week to go with my Ultimate Grilled Flank Steak and it was scrumptious! 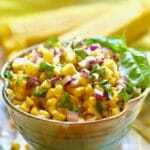 And, the best part is that this corn salad is even better the next day as leftovers. I have had it for lunch for the last two days and enjoyed every last bite! My guess is there are a few of you out there that are not a fan of red onions but don’t let them scare you off or prevent you from making this delicious salad. I usually much prefer the sweeter milder taste of sweet onions like Vidalia onions, but the red onions really work in this salad and I’ll bet if you just give them a chance you will be happy you did. 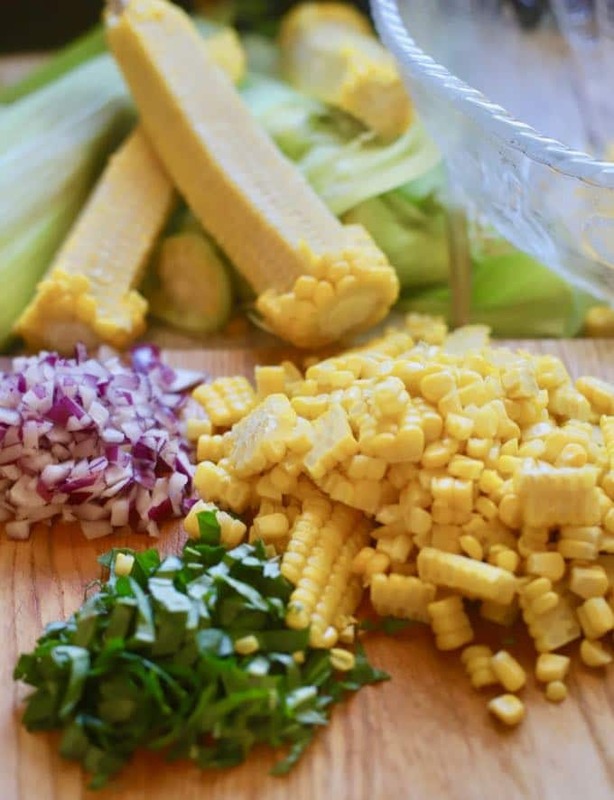 I’ll bet you didn’t know besides being a delicious side dish, the term “corn salad” also refers to a wild weedy plant that Thomas Jefferson once cultivated at his home in the early 1800s. But today’s post is all about the classic corn salad we eat and I can’t wait to show you how quick and easy it is to make. 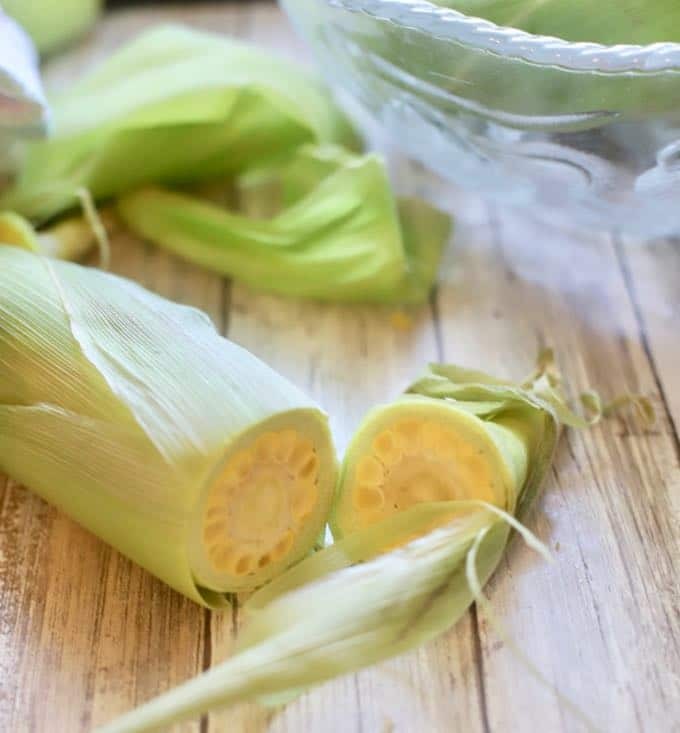 If you like corn, you might also like to try these delicious and popular corn recipes: Easy Spicy Southern Corn Casserole, Easy Cheesy Hot Corn Dip, Corn, Tomato and Avocado Salad, and Southern Homemade Creamed Corn. Cook on high for 3 minutes. 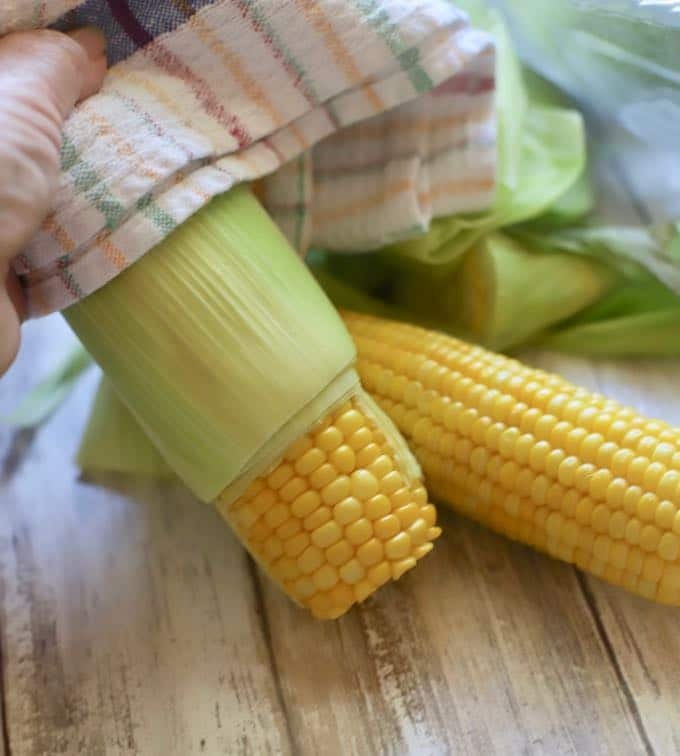 Let the corn cool slightly and, using a potholder or dish towel, squeeze at the top. The husk and silk will slip off. Set aside and repeat with the other ears of corn. Combine the cider vinegar, olive oil, and salt and pepper in a medium-size bowl. Mix well. Add the onion and corn kernels and toss to combine. Just before serving, add the basil and stir to combine. Serve immediately. Leftovers keep well covered in the refrigerator for several days and are even better the next day. *To cook the corn on the stove instead of the microwave, place the shucked corn into a large pot of boiling water over high heat. Cover the pot and turn the heat down to medium. Cook for 4-6 minutes. Drain. Easy Southern Corn Salad only takes minutes to make and, because it's made without mayonnaise, it’s fresh, light and healthy. 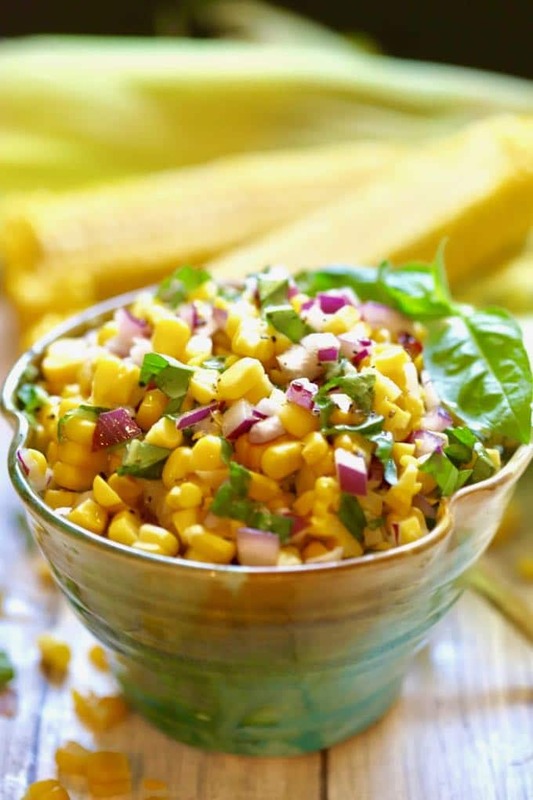 Coming in at only 155 calories per serving, this yummy corn salad is also full of vitamins and minerals. It's perfect to take to a potluck or to serve at a backyard barbecue or picnic. This looks amazing!! I like that it is made without mayo, so it can sit outside at a summer picnic, without too much worry! I’m so glad I found your blog! very nice! I just posted about two “farm to table’ restaurants, I hope you will stop by!! how many servings does this make at 155 cal each? Hi Cheryl, 6 servings, about 1/2 cup each.